This project has mapped and geolocated New York City studios, photographer’s residences, and suppliers as a means of understanding the initial development of the first major photographic business centers and the economic development of historic photography. 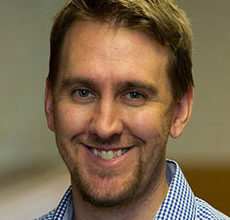 This workshop featuring the development firm Collective Access will explore how software tools can efficiently support project-based learning. Please join the NewYorkScapes working group at NYU for an informal happy hour to share ideas for the group's events and activities for the coming year. 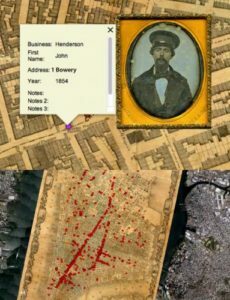 Students in the digital humanities graduate course “Mapping Archives: Cultural Geographies of New York City” will present their projects from Fall 2014. Jo Livingstone, a fifth-year in the English PhD program, will circulate a sample from her dissertation, "Middle English Imperial Romances and Landscape of British Nationalism." 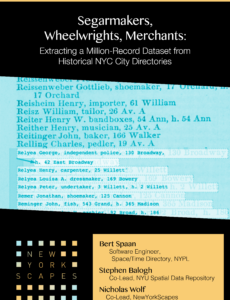 Come hear about an ongoing effort to extract over a million entries documenting the New York City's from its historic city directories for public use. 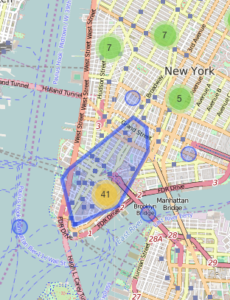 NYWalker is a distributed project that aims to develop a rich database of places mentioned in various novels.